I have followed your Weston A. Price research and diet for years. I host a nonprofit organization dedicated to helping combat veterans who struggle to reintegrate back into the civilian world. We have found that at least half of those who have been awarded PTSD-related benefits are actually suffering from severe malnutrition. After a few weeks on exclusively wild meats (venison and wild hog), raw unprocessed milk, bone broth by the gallon and home-fermented foods, free-range lamb or mutton and poultry (eggs and meat from heritage turkeys, chickens and ducks) that we raise ourselves, about half of the veterans find their PTSD symptoms vanish. We do not advertise and do not wish to have any public attention since we are a very small all-volunteer nonprofit and are not equipped to deal with such things. Much of what you have lectured about appears to be true according to our experiences with a variety of combat veterans. LEFT: Death mask of King Tutankhamun, about 1300 BC, showing typical broad facial structure of pharoahs during that period. RIGHT: Typical narrow facial structure evident in death masks from the Roman period. I am writing because ancient mummies dating back as far as four thousand years are in the news again. I’m interested in what is being said about the ancient Egyptian mummies—wealthy individuals, of course, who reportedly existed on a diet based on bread, a little honey, plenty of beer, lots of fruits and vegetables and almost no animal products at all. From what I’m reading, farm animals and fish were very common but the nobles apparently didn’t eat them much at all according to the amino acids found in their hair. Perhaps those wealthy people who were wealthy enough to be mummified simply rejected anything that the poor people ate, including meat and dairy products. What strikes me most about the latest news is the high incidence of heart disease and painfully rotted teeth in the mummies that have been studied. I’ve thought a lot about these recent findings, and it appears obvious to me that what they were missing was Vitamin K2 as well as vitamins B12 and A.
Editor’s Note: We don’t know why the Egyptian nobility opted for a plant-based diet, but we can see the effects on facial structure in some of the later mummies. I have a Facebook friend and over the last ten years I’ve seen her post endlessly about her sickly children: allergies, asthma, braces, accidents, always being sick and on and on. It is so depressing. One child has swelling on his uvula. She posted a photo showing his wide-open mouth with irritated uvula, to see whether other parents had dealt with this while she waited to take him to the doctor. You can see braces and a spacer between a couple of his teeth—lots of orthodontic problems. Among the conversational thread under that, she said that the child has a borderline low immune system and had to be revaccinated for many childhood immunizations and the flu. He was also taking a steroid, Flovent, for eosinophilic esophagitis (EoE). We are not close enough for me to say anything. I don’t comment unless someone asks me because food and health are such sensitive subjects. She’s demonstrated that she constantly takes them to allopathic doctors and does whatever they say, so I doubt she’d listen to me and would probably lash out. (I think I’ve seen more posts about her kids and doctors than anything else from her.) It is just terrible what so many of today’s children are going through, robbed of normal, vital childhoods. Our family is a member of the WAPF, so we know the importance of good nutrition in humans, but what about our furry friends? We have a toy poodle that is one-and-one-half years old which we do not vaccinate and feed an all-raw diet consisting of a blend of meats, bone, organ meats and raw fruits and veggies. We also supplement with coconut oil. We recently bred her with a three-year-old male long-haired dachshund that eats raw as well. We supplemented her diet with raw eggs from our pastured chickens during the pregnancy and now while she’s nursing. We read and were told many times that she would likely only have around two pups, being her first litter and all. Toy poodles “normally” have two to four puppies and five would be rare. She ended up having five beautiful, healthy puppies. How our little dog had all those pups in her was beyond us. The delivery went perfectly with no complications and she is nursing them well and they are all thriving. We attribute this all to her (and the male’s) wonderful diet before, during and after conception. The wealthy non-vaccinators are not affected, just the working classes as they are the ones who receive family tax benefits and childcare benefits. Now the South Australian state government is planning to pass the No-Jab-No-Play Bill, barring unvaccinated children from childcare, preschools and kindergarten. Some doctors are even stating they won’t see children who are not vaccinated. This is a complete abrogation of their duty of care and professional licence. Now we also face an attack on all other natural health modalities, including naturopathy, homeopathy, chiropractic, herbal medicine, acupuncture, yoga and even massage, with pressure on health funds not to cover these practices. A corrupt and flawed National Health and Medical Research Council report, which ignored hundreds of positive overseas studies in relation to homeopathy, is cited to justify these attacks and has even provided justification in Great Britain to shut down homeopathic courses at colleges. We are in a serious battle to keep our choices of healthcare, and I am appalled at what is taking place in this country. The power of pharmaceutical giants is, in my opinion, out of control, and the fact that governments take big donations from them is very troubling indeed. We know that a small amount of polyunsaturated fatty acids (PUFAs) are essential in the human diet. But as Gary Taubes points out, there is no clear evidence that excessive amounts of PUFAs derived from industrial seed oils in replacement of saturated fatty acids are beneficial; larger and better trials need to be done. Why do we continue to experiment on the American public? Isn’t the increase in the prevalence of obesity and diabetes over the past four decades evidence that something has gone wrong in our “enlightened” approach to nutrition? Finally, why do we consistently fail to consider that foods higher in saturated fats (like whole eggs, meat and liver) supply essential nutrients such as preformed vitamin A, vitamin B12, choline, iron and zinc? These nutrients are ones that many sectors of our population, including women of childbearing age and the elderly, often underconsume, according to NHANES and other data. On the other hand, as a registered dietitian, perhaps I should thank the American Heart Association and the U.S. Department of Agriculture for creating a constant supply of overweight and diabetic clients. At age four, my son was diagnosed with two deep cavities and two infected root canals. Under the supervision of a dentist and with regular check-ups, we followed the Weston Price diet. He is now seven years old. We have not filled any cavities. One of the teeth with the large decayed root canal broke in half. The other tooth lost the decayed part but is otherwise complete. Same for the cavity teeth. One of these teeth is now shaking, so the end is finally in sight for these unsightly baby teeth to fall off. His adult teeth are coming in beautiful and strong. Our entire household has changed our diet. I was prediabetic, but as a side effect of following my son’s diet, my fasting blood sugar plummeted. I am still very careful to give my son fish liver oil, bone broth and ghee. He has these daily, even on vacation. We eat minimal grains and have eliminated dried fruit like raisins. When he goes for birthday parties, he eats what everyone else eats. But at home and for lunch at school, that is where I am careful. When I started out on this journey, I could not find documented evidence anywhere that Weston Price’s method worked. Four dentists laughed at me, one threatened to call CPS on me. I want people to know that this is not just a theory in a book, but it works! I very much enjoy your scientific articles, especially the ones by Chris Masterjohn and Stephanie Seneff. Her article on glyphosate (Spring 2017) showed clearly the bio-chemical pathways by which this herbicide damages human living cells. Her article on cholesterol sulfate deficiency and coronary heart disease (Summer 2017) was very intriguing even though many of the explanations were a bit difficult to understand for a lay person. Yet, I am getting the gist and see the link to our chemical exposure and life style. I recently read a book, The Invisible Rainbow, by Arthur Firstenberg, PhD, about electromagnetic radiation causing similar problems in our bodies, not necessarily just with the cardiovascular system. It is a very well-researched book and quite a volume with over five hundred pages. The most interesting chapter is the one on porphyrins. In it he blames damage to the same cytochrome P450 enzymes that Seneff discusses. He also uses charts and statistics to link the advent of computers and cell phones to the epidemic of metabolic syndrome and heart disease. I assume there is more than one pathway of injury to our health, and I am so thankful for the Weston A. Price Foundation with its sound nutritional and lifestyle advice. I’ve been a member for seventeen years and feel great at eighty! Our symbiotic gut bacteria are really a part of us, and we work together for the good of all of us. We don’t just eat for ourselves, but for one thousand trillion. That’s eating for 1,000,000,000,000,001. Recently it’s been noted that we may carry upwards of ten thousand different kinds of microbes. Our human cells specify “only” twenty thousand protein-coding genes. Human intestinal tract studies suggest that there could be over ten million non-redundant genes in the human microbiome. We are hearing talk of guts that have a high gene count (HGC) and a low gene count (LGC). Those with HGC have a much more robust gut microbiome and lower prevalence of metabolic disorders and obesity. Low-gene-count individuals harbor a higher proportion of pro-inflammation bacteria. Human immunity starts primarily and strongly in the gut. Lipitor is an antibiotic. Glyphosate (Roundup) is a patented antibiotic. Adjuvants in vaccines and the active agents are a soup of antibiotic and blood-brain-barrier-busting molecules and toxins; they make a gut very leaky. We are bombarded with substances that adversely affect our gut bacteria and lower our natural immunity. I have been following the Wise Traditions diet for the past six years and I would say that it has hugely benefited my life and that of my family. The timing was great as my two daughters have had children in the past two years and I did not let them get away with not eating well. One daughter followed the principles to the letter and has the most strong, healthy two-year-old; the other, unfortunately, did not do so well, and her child has been unwell many times. The good news is that she is now starting to believe the wonders of a nutrient-dense diet for herself and her family, and in her current pregnancy she has been doing very well. The baby is due any day and I know it will be strong and healthy. I live in a very small town and the main reason I decided to become a chapter leader is to try to bring some help to the children of this area. I am fifty-seven and have never seen such unhealthy babies and children as there are today in the world. It is heartbreaking to see the assault on children’s health today through bad food, environmental toxicity and the constant and ever-growing modern assault of vaccinations. Again, I applaud WAPF for giving people a way to combat this and to empower them to manage their health themselves and find healthy alternatives. What does WAPF think about organic sulfur crystals (methylsulfonylmethane, or MSM) as a source of sulfur and cardioprotection? In Dr. Seneff’s article on sulfur and cardiovascular health (Summer 2017), it isn’t mentioned in her list of sources. I have never taken MSM myself, but I have heard many people say that it was very helpful for them. It’s a very interesting molecule, because it provides two methyl groups along with a partially oxidized sulfur atom that almost surely can be converted to sulfate, although I don’t know any details about how it is incorporated into our tissues in terms of its biochemical reactions. There are products that supply MSM along with chondroitin sulfate and glucosamine sulfate. I suspect that all three of these are good sources of sulfur, although people don’t usually think of the “sulfate” in the latter two as being the biologically active molecule. How was the decision reached that conventional beef, bison, lamb or goat is put in the Good category? Under Fresh Meat’s “Avoid” category, it states “Most commercial chicken, turkey and pork, which is raised in confinement on industrial farms.” So why not beef raised in similar conditions? 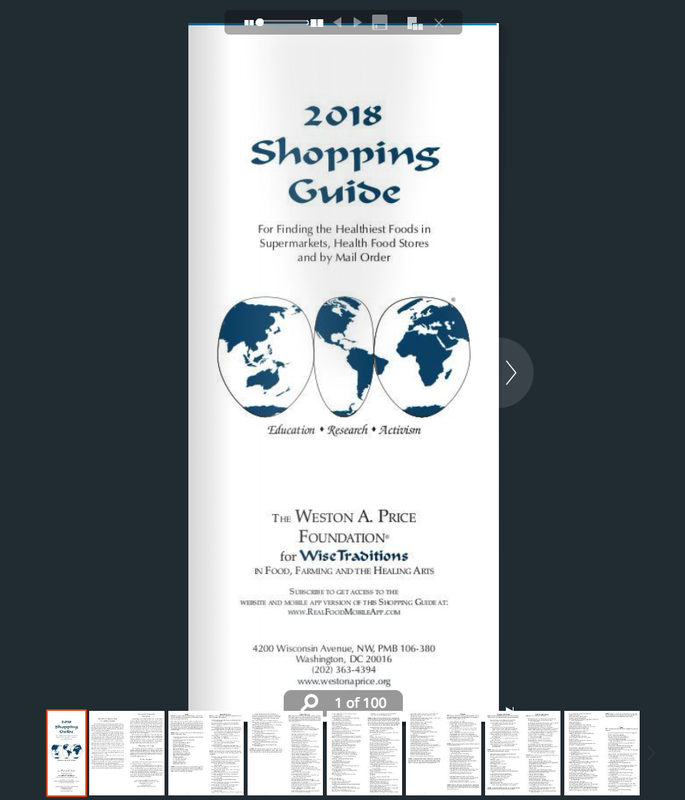 Editor’s Response: The shopping guide was conceived as a way to give guidance to people wherever they are—for some, even many, people, their only choice is a supermarket, military commissary or prison canteen. In these cases, we advise them that red meat (mostly beef) is a better choice than poultry or pork. In the case of beef, at least the beef in the U.S. is raised on the range for the first eight months of life. Also, beef cows are much less likely to be fed soy than chicken or turkey (or farmed fish, for that matter). In an ideal world, we would all purchase our meat directly from farmers doing pasture-based practices, and through our extensive chapter system we have helped thousands of health-conscious consumers connect with such farms. Unfortunately, we do not live in a perfect world, and everyone needs to eat. So we try to guide people to the most healthy foods available to them. I was experiencing a period of significantly declining health right as the millennium turned, the year 2000. In searching for answers, I listened to the talk, “Why Butter is Better,” by Sally Fallon Morell. When she said “Lard is a very healthy fat,” I thought, “This lady is crazy!” But I couldn’t get the message of the tape out of my mind. Shortly thereafter, I found the Weston A. Price Foundation, and my life and health changed for the better. Much better! I have every issue of Wise Traditions beginning in 2000, and they are all dog-eared from reading many times. I’ve listened to most of the CDs from the yearly conferences, and of course read Nutrition and Physical Degeneration and many other books. I’ve refined and enriched my diet over the years with this priceless wisdom, and now eat a wonderfully nourishing diet including homemade broth and soups, liver, raw milk, properly prepared grains and lentils, homemade sauerkraut, eggs from our chickens, cod liver oil, wonderful meats and vegetables from our local farmer’s market, and of course, lots of butter. My health has mostly reflected these changes; in fact, my allopathic doctor recently said that I could “brag about my excellent cholesterol profile,” for although it is a robust 238 total cholesterol, she recognized the fact that the proportions of the various factors were all ideal! However, without going into a long story, I recently found out that I have one very large gallstone, with no inflammation associated with it. Although my doctor is uncertain as to whether it is the cause of some recent symptoms, nonetheless I am troubled. The practitioner who did the ultrasound happily told me that “it could be easily fixed,” by removing my gallbladder. And of course, eating fat is blamed for gallbladder problems by mainstream medicine. That terrifies me, because I know beyond doubt that one of the best things the Wise Traditions diet has done for me is to balance out my former hypoglycemic swings. When I came home from the doctor, I tried modifying my fat consumption for just one week to see what might happen. Predictably, I felt awful, had a very hard time balancing my blood sugar, experienced cravings, was constipated and so forth. I do not plan to have it removed unless I experience dire problems, but in the back of my mind is always the question: what if that happens? I wonder whether Wise Traditions might consider publishing an in-depth article on gallbladder problems? They are not glamorous, but they seem to be almost epidemic in these times; I talk to so many people who have had their gallbladder removed. I can find very little information online with an alternative perspective on gallstones, and the few I do find, including Tom Cowan’s very welcome article, focus on prevention, stating that if one eats good, healthy saturated animal fats (as I have done for seventeen years), it will prevent gallstones. But that was not the case for me. I have read some surprising references to melatonin playing a significant role in gallbladder health, but can’t find much detail about it. I cannot believe that the diet that has improved my health so remarkably over the past seventeen years would now cause something to go seriously wrong. Something else must be going on here, and I think there are many people out there who would love to hear your perspective on this subject, especially if you can dig a little deeper. I don’t know who could do it better! Thank you so much for the work of this organization—it is profoundly important work. We are hampered by the lack of information, just as you are. Hopefully your letter will help us find someone knowledgeable about the causes of gallstones who can write this article, so many may benefit. In 2008 for my well-being, that of the planet and CAFOs (concentrated animal feeding operations) animals, I decided to follow a vegan diet. I meticulously followed the food rules. I lost weight and according to the medical practitioners, my “numbers” were great. However I didn’t feel great. I was exhausted, lacked energy, had low concentration and was definitely losing my short and long-term memory. A test revealed I was dangerously low in vitamin B12, even though, mindful of the potential for B12 deficiency on a vegan diet, I had been taking supplements. My doctor recommended a high-dose vitamin B12 supplement, which I took for a year—my numbers went lower. So I tried monthly injections for two years and my numbers continued to fall. I since discovered that the usual vitamin B12 cyanocobalamin injections were made with genetically modified ingredients. At that time my vitamin D was also low. It became clear to me that I was making myself ill. In 2013 I started eating wild-caught Alaskan salmon. I also found a wonderful source of 100 percent grass-fed dairy products and began eating yogurt and kefir made with raw milk on a daily basis. Gradually I began to include more 100 percent grass-fed and appropriately fed meat from animals living their intended life and killed humanely. At the same time, I became more vigilant about only eating organic/non-GMO foods. The outcome of all this, four years down the Weston A. Price Foundation path of nutrition, is that I make all my own bone broth, yogurt and kefir from 100 percent grass-fed raw milk, eat plenty of sour cream and take extra -virgin cod liver oil daily. As someone who has had difficulty maintaining a healthy weight for most of her life, it has stabilized at a good weight for my height and build. My memory, concentration and energy levels are better than they have been in years. My numbers are fine and I take no medication. I am proof positive that eating whole, raw, organic food from grassfed animals makes a difference to our health and well-being. Thank you, Weston A. Price Foundation, for providing such useful and beneficial information. @Sue O’Rourke. Do you kill those animals yourself or at least watch them being killed? Some people cannot tolerate this. What do you expect them to do when they are told their health problems could very well be caused by no animal flesh in their diet? Please do not say that, well, you don’t make your own shoes or build your own refrigerator, either. Those activities are quite different from the ugliness of animal slaughter. There’s no humane animal slaughter – I have seen it (for real, I’m not talking about videos or movies). I am not even a vegan, but I sure wouldn’t eat anything I could not watch being killed and gutted. About the gallstone issue. Not everything is directly caused by diet. It is not that simple, it’s a fallen world and we all get sick in one way or another. And it is not going to be cured by diet either. You can tweak your diet til the cows come home, but especially nowadays with almost everyone being such a weakling, some kind of medicine is needed. I have heard that there’s Chinese herbs that will dissolve gallstones, Lysimachia just for starters. It all takes time.